Though currently residing in London, as a Polish passport holder I participated in the country’s general election last Sunday. On October 9, 2011, to my satisfaction, the Polish public elected Europe’s first transsexual member of parliament, Poland’s first openly gay parliamentarian, and its second person of color to become a lawmaker. As a result of the vote, the anticipated victory of the incumbent centrist Platforma Obywatelska (Civic Platform) and its minor coalition partner came to reality, winning almost 50% of the vote. However, the newly elected members of the Polish parliament turned out to represent a more diverse pool of present day Polish society than expected: two are black, and two belong to the LGBT community (alongside the constitutionally granted presence of two German-minority MPs). What happened is no accident; it is a result of more than two decades of Poland’s democratic transformation, its active European membership, and the important role of civil society in the country. John Godson was reelected in Lodz, and Killion Munyama was chosen for the first time in Grodzisk Wielkopolski making him the second Polish MP of African descent. Both are naturalized Polish citizens from Nigeria and Zambia, respectively. They will be representing not only their local constituencies, but also the community of people of African heritage living in the country. The first wave of Poland’s black community came to the then-communist country as students from decolonized, left-leaning African states. The current flux of African-born immigrants is driven more by economics and welfare, rather than ideology. Nevertheless, the still-scarce (in comparison to post-colonial states) yet visible minority has its representation in the highest level of the government. Interestingly enough, they are both members of the ruling center-right party led by Prime Minister Donald Tusk, who just secured four more years in office. The two newly elected members of parliament who became famous as LGBT activists in recent years are a sign of an even more tremendous change taking place in Polish society. They represent a much larger and more prominent minority; one that was subject to immense institutional and political hostility as little as 6 years ago, most notably from the late president Lech Kaczynski . Thanks to this right-wing backlash, which supplemented the post-communist xenophobia, gay people in Poland became the emblematic other in the society (Bauman, 1995). For almost two decades after Poles were the first ones to take down their communist regime, the LGBT community existed in the public discourse as the totemic threat to the traditionally conceived social bonds. The fragile cohesion of a society struggling to hold together in times of postmodern cultural and economic transformation was allegedly weakened by the ‘homosexual peril.’ It was a view repeatedly asserted in the public sphere by conservative social actors, and most notably by the Catholic Church, then headed by John Paul II. Hence, the electoral victory of LGBT candidates: Robert Biedron and Anna Grodzka ‘ both from the popular leftist-liberal Ruch Palikota (Palikot’s Movement), led by eccentric millionaire Janusz Palikot ‘ is a sign of true changes in attitude towards difference that Polish society has undergone since ’89, as well as EU integration in 2004. Robert Biedron is the first openly gay parliamentarian to be sworn in the 518-year history of Poland’s lower legislative chamber, the Sejm. For the past decade, he has been the leader of the the Polish Campaign Against Homophobia, a civil rights movement fighting for LGBT liberation. He was visible in the public sphere and known for his conviction, sharp language and bravery in confronting far-right extremists. Though a member of a social-democratic party, Biedron for many years existed on what one would call the sidelines of the mainstream political life specifically because of his sexual orientation. However, his activity in bringing visibility to LGBT issues, including once-severe discrimination against gay people in Poland, gave him the reputation of a vigorous and restless civil rights leader. After being pushed away by the left-wing establishment, Biedron joined the ranks of the popular, socially-liberal Palikot’s Movement. Biedron received overwhelming support in his constituency on the basis of a pro-tolerance and secular agenda, and became Poland’s first openly gay man to sit in the parliament in Warsaw. The new political force that brought him to office is still a mystery for most commentators and spectators of public life in Poland, yet its platform ‘ calling for separation of church and state, pro LGBT rights, urging for women’s reproductive rights and a ‘realistic’ anti-drug policy ‘ gave it over 10% of the total vote, making it the third political power. Furthermore, its most contentious candidate, who was elected in the seemingly conservative city of Krakow, became Europe’s first post-operative transsexual woman to hold a publically elected office. Anna Grodzka is a trained clinical psychologist, civil rights activist, and head of the Trans-Fuzja foundation, which helps transgendered individuals and raises public awareness of their issues. Her election, apart from being featured in the Guardian, Telegraph, The New York Times, Le Parisien, and virtually all Polish media, is the result of ongoing efforts from Polish human rights activists focused on bringing the issues of gender-identity discrimination to the public forum. In that sense, it is truly her personal victory as well. It is an outcome of a true transformation that took place in Poles’ attitudes towards otherness. Although it might sound naive, this is a sign of change that has already happened in the country – not only one that her presence in the Sejm will bring in the future. In this election, we saw a great deal of diverse candidates. One was the Green Party’s Krystian Legierski, a member of Warsaw’s City Council and Poland’s first openly-gay elected official, who unfortunately did not make the cut. One who did, however, was Wanda Nowicka, feminist and women’s reproductive rights advocate, who has ferociously been fighting against the inhumanly restrictive anti-abortion law in Poland. The non-biased support for candidates from minority backgrounds, regardless of their politics, affirms the considerable growth of tolerance towards difference that is already a fact in today’s Poland. It is fueled mostly by Poland’s entry to the EU, and its opening-up to the rest of Europe. The rise in foreign investment, people’s mobility across the EU, travel, and other forms of social and cultural exchange in merely 7 years has made Poland a country where a candidate’s sexual orientation or ethnicity does not matter in the ballot. Furthermore, over 10% of the voters supported Palikot’s Movement, a left-wing radical party urging for real secularization and liberalization of the country, which by and large has been known for its social conservatism. On one hand, casting the vote for a black, gay, or transgendered candidate is a sign of the increasing laissez-faire attitude in society. On the other, it is a voice of contestation against the hegemony of the majority of white, straight and Catholic Poles. 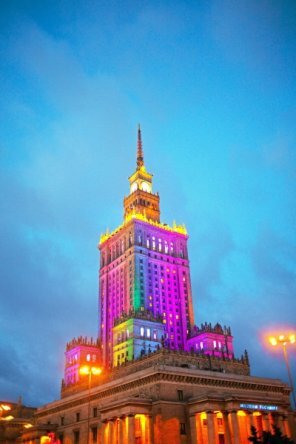 Just like the election of Barack Obama meant that the US had finally fulfilled its promise of equality for all, so are Poland’s two LGBT members of the new Sejm in Warsaw the result of the post ’89 democratic transition and EU accession. They are examples of the true transformation that the Polish public underwent in the past two decades, and a sign for more profound ones that are yet to come. In 2005 Mr Kaczynski, then mayor of Warsaw, infamously banned the Gay Pride march for ideological reasons. ← Mondli Hlatshwayo: Reconnecting after thirteen years!